Join the NAP and SRAPs for the inaugural Virtual NTW, a series of webinars scheduled for November 27-29. Since the traditional NTW has been moved from the fall to the spring, the NAP decided that a virtual conference would be useful for providing AgrAbility staff members with updates on new work plan activities and communicating some of the information normally shared at the NTW. We also hope to use this event to increase the level of interactivity in our web-based presentations and meetings. Fire up your web cams and microphones for a session on the interactive features of Adobe Connect. Participants will have the opportunity to experiment with functions that will be available to them during the remainder of the Virtual NTW and in future webinars, such as the ability to ask questions and make comments via voice and/or video connections. Learn more about the purpose and format of the Virtual NTW, meet the new NAP partners from Goodwill of the Finger Lakes, and hear about the Core Competency initiative that will be implemented during the next four years. Join Brad Rein, Aida Balsano, Alexandra Wilson, and Cami Compton for an introduction to the new staff and their responsibilities plus a discussion of other USDA issues related to AgrAbility. The evaluation component of the NAP will be enhanced significantly in the new work plan. Bob Fetsch will discuss where we are now and where we're heading. Find out about the new comparative study to demonstrate the impact of AgrAbility and learn how you can participate. eXtension is a growing resource for information on many issues, and a new farm safety and health section was recently added. The leaders of that initiative, Aaron Yoder and Linda Fetzer of Penn State, will discuss features of their site and explore enhanced connections with AgrAbility. The Northwestern University Prosthetics-Orthotics Center recently published "Assessing the prosthetic needs of farmers and ranchers with amputations" in the journal Disability and Rehabilitation: Assistive Technology. Craig Heckathorne of the Center will summarize the results of their NIDRR project and discuss needs for the future. Did you realize that you can create individualized albums of Toolbox products for specific clients or particular disability/agriculture issues? Find out how to do this and more with Cliff Racz during this 30-minute mini-webinar. YouTube is an invaluable resource for sharing videos for your project. Are you using it? Do you know how? Cliff Racz will give you the essentials during this 30-minute interactive session. Approximately 50 people participated in the NAP/Indiana AgrAbility workshop, Veterans and Agriculture: Opportunities for Employment, Entrepreneurship, and Enrichment. Classroom sessions were held on Wednesday and focused on finding financing for new farmers, the different kinds of operations that could be a good fit (i.e. produce, grain, livestock, or niche markets), and how to write a business plan. Other sessions were geared more for professionals working with veterans, such as dealing with post-traumatic stress disorder (PTSD) and/or traumatic brain injury (TBI), reintegration challenges the veterans may face, and using horticulture as therapy for veterans. Special guests included Michael O'Gorman, executive director of the Farmer Veteran Coalition, and Sandy Lane, horticulture therapist from the VA in Roanoke, Virginia. SRAP staff attending included Gail Lapierre from Vermont, Alan Filyaw from Tennessee, Karen Funkenbush from Missouri, and David Cessna from Colorado, in addition to most of the Indiana SRAP staff and consultants. The second day of the conference was devoted to on-site learning. 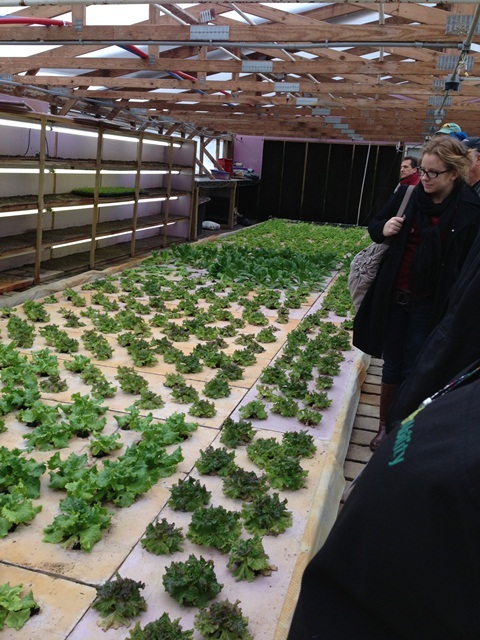 Participants visited the Purdue aquaculture facility and the Purdue sheep facility in the morning and then toured This Old Farm, a meat processing facility, and Pleasant Acre Farms where they raise vegetables and produce in a hydroponic greenhouse and outdoors. The National AgrAbility Project staffed a display at the National FFA Convention in Indianapolis October 24-26, 2012. The National FFA Convention attracts approximately 55,000 blue jackets from all over the U.S. The display included a John Deere tractor with a Life Essentials lift, an AT tool display, NAP publications, a contact list for all of the SRAP projects, and a grain safety display. Amber Wolfe represented the National AgrAbility Project at the 2012 APRIL Conference in Reno, NV from October 5-8. She hosted a display booth for the project and gave a 90-minute presentation on Arthritis and Agriculture. Billy Alton, APRIL executive director, is a member of the NAP Advisory Board.